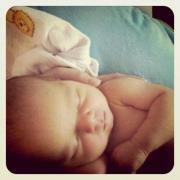 Many friends and supporters of Key Ministry are already aware of the new addition to our team last week. Harmony and Skyler Hensley welcomed Ransom Levi Hensley into their family early last Friday morning. Harmony very eloquently described the way in which Ransom’s arrival represents God’s response to years of prayer from the Hensley’s, their family and friends. Check out her post-it’s a must-read. From a spiritual development standpoint, I can’t imagine how Ransom could have been given a better family. He has two parents who don’t just talk the talk but walk the walk. He’ll be exposed to all of the great stories of the Bible. He’ll be surrounded by people who will model an active and meaningful prayer life. Had he come along a day or two earlier, he might have found himself serving at his first respite outreach. He’ll always be surrounded by a supportive church family while growing up. But imagine the task confronting the Hensley’s over the next 18+ years! Given the advances likely to occur in modern medicine, there’s an extremely good possibility that Ransom will still be serving God here on Earth (like Bill) in some capacity in the 22nd century. Consider how the world has changed in our lifetimes. What kind of world do we need to prepare him to face? I’ve spent a lot of time this past year in the Old Testament. I’m amazed at the recurrent ineptitude of the spiritual leaders in Israel to pass along their faith to the next generation. Whenever Israel had a godly king, his heir generally demonstrated a tolerance for immorality and pagan worship exceeding that of preceding generations. I’d think that the kings would have prioritized their relationships with their children, if for no other reason than the reality that the preservation and expansion of the king’s legacy fell to his their children. I wonder if their stories were preserved as a reminder to us to depend upon God and to share the knowledge of Him with our children continually. It’s hard for me to imagine any service we can provide more important or more impactful to the Kingdom than addressing the spiritual development of our kids. And not just our biological or adopted children…all of the children in our sphere of influence. I hope Ransom has the opportunity to be a part of a church that will support him in fully using his gifts, talents and abilities to serve God’s purpose in his generation. I hope Ransom will have the opportunity for relationships with adults who will reinforce and model for him the principles he’s taught by his parents. I hope Ransom will be well-prepared for the spiritual battles he’ll have to confront in the world in which he’ll serve. I hope Ransom’s children will know and love God and grow the spiritual legacy established by their grandparents. Welcome to the team, Ransom! This entry was posted in Parents and tagged Harmony Hensley, Ransom Levi Hensley, Skyler Hensley. Bookmark the permalink.